I can't achieve the effect I want, instead the text appears to be just indented and not preformatted as a block. I have noticed this frequently with lengthy paragraphs which need to be formatted as code. 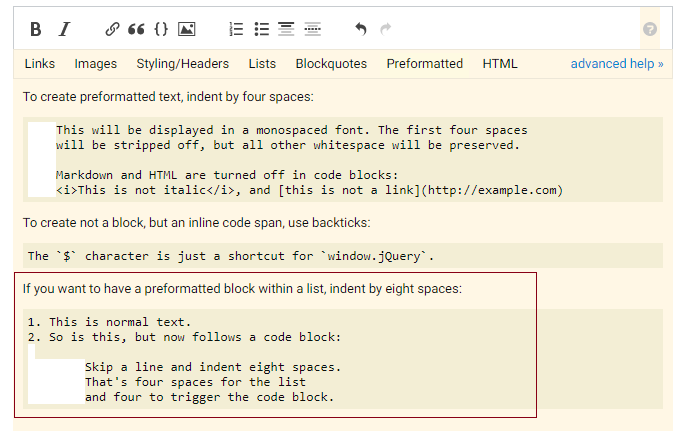 Inline preformatting works fine with `` . How can I create a preformatted block of text during editing? For example I was trying to edit this post: Tasker to programmatically uninstall apps. This is what I got so far, it might not be the most efficient way to do it. I run the following command via Termux Task plugin. I suggest, instead of using whitespaces in every line, use <pre> and </pre> at the beginning of first line and end of last line. If you're editing the text which falls between a list, simply add one whitespace before <pre> to align the whole preformatted text with the list. E.g. It seems my issue was that I was trying to create preformatted block within a list. Revise tag prompt text to encourage fewer device tags? How to create tags without creating a question? Should tag description be required when creating a tag? How to set/change “parent user” field to show the combined flair in the chat user page?